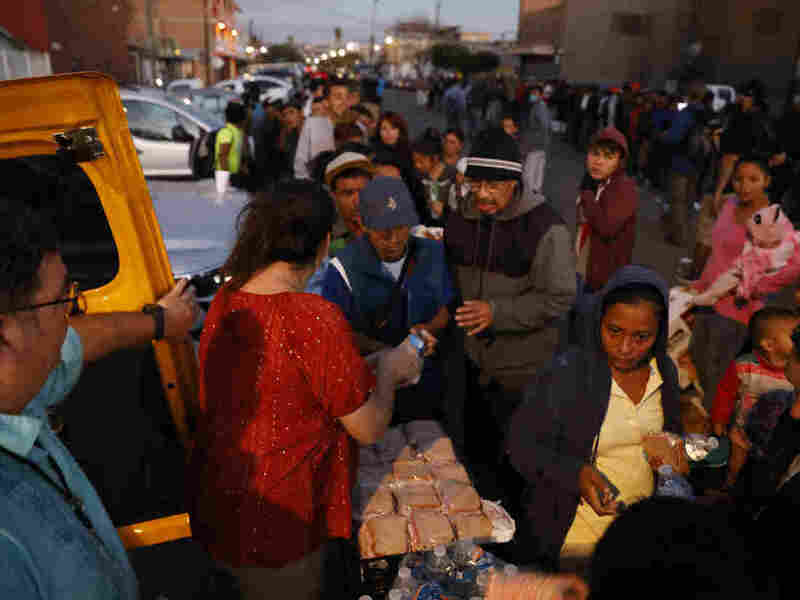 Trump Plan Could Leave Asylum-Seekers At Risk In Mexico The Trump administration wants Central American migrants to stay in Mexico while asylum claims are processed. But human rights groups believe that could pose dangers for Central American migrants. Well-wishers distribute food to migrants outside of a sports complex where more than 5,000 Central Americans are sheltering, in Tijuana, Mexico. President Trump wants the migrants to stay in Mexico while their asylum claims play out in U.S. immigration court. The crowd of Central American migrants gathering on America's doorstep has reached into the thousands. President Trump wants those migrants in Tijuana and elsewhere to stay in Mexico, at least until their asylum claims are approved. But that could leave these migrants — many of whom were fleeing violence in their home countries — in another dangerous situation. "There's been extensive evidence of the dangers that asylum-seekers and migrants are facing in Mexico," said Eleanor Acer, director of refugee protection at the group Human Rights First. "Ports of entry in particular, many of them are under the control of cartels," Acer said. "Asylum-seekers have been kidnapped, held for ransom, made vulnerable to traffickers." We spoke to one migrant who knows first-hand how dangerous the Mexican border states can be. We're not using her name because she's afraid of the violent gang that threatened her back home in Guatemala. She fled in 2013, along with her two children, who were 13 and 14 at the time. It was about 11 p.m. when the bus they were riding in stopped a few hours from the U.S. border, in the Mexican state of Tamaulipas. "Armed people wearing facemasks came on board the bus, and they asked us for Mexican IDs," she said in Spanish through an interpreter. The gunmen who kidnapped them were from a Mexican cartel, she says. After four days, her family in Guatemala came up with three-thousand dollars in ransom money. When they got to the border, the woman described the ordeal to Mexican police. "I told them what had happened to us," she said. "And all they did was laugh." The family crossed the U.S. border illegally. She's now seeking asylum. But thousands of migrants like her are stuck outside ports of entry, from Tijuana to Matamoros, with little money and no local connections. U.S. Border officials have strictly limited how many migrants can make asylum claims at ports of entry each day. They've clamped down so much that the waiting time is now weeks or months. Now the Trump administration is negotiating with the incoming Mexican government on a new plan. It would force migrants to remain in Mexico for months or years while their asylum cases play out in U.S. immigration court. "Migrants at the Southern Border will not be allowed into the United States until their claims are individually approved in court," Trump tweeted over the weekend. "There is no way that the United States will, after decades of abuse, put up with this costly and dangerous situation anymore!" But critics say the Trump administration can't force asylum-seekers to wait somewhere they're not safe. "If they have to stay there months or years, there's no question they will not be safe," said Lee Gelernt, who is deputy director of the Immigrants' Rights Project at the American Civil Liberties Union. "So right off the bat, we can't imagine any proposal will be legal." The Trump administration says it's been trying to discourage migrants from leaving Central America and making the dangerous trek north in the first place. But that has not stopped a record number of families from arriving at the Southwest border in recent months. And immigration hardliners say they have to be stopped. "If the Trump administration does not take extraordinary and creative steps like this, then more and more people are going to come," said Jessica Vaughan, director of policy studies at the Center for Immigration Studies, which favors lower levels of immigration. Vaughan says the government has required some asylum-seekers to apply from outside the U.S. before, and she thinks that could work again now. 'The Mexican government had no incentive to cooperate with us as long as it was OUR problem," Vaughan said. "When it becomes their problem too, then they're gonna be motivated to work with us to help fix it." The new Mexican government officially takes power on Saturday. Secretary of State Mike Pompeo is set to meet with the new foreign minister the next day.